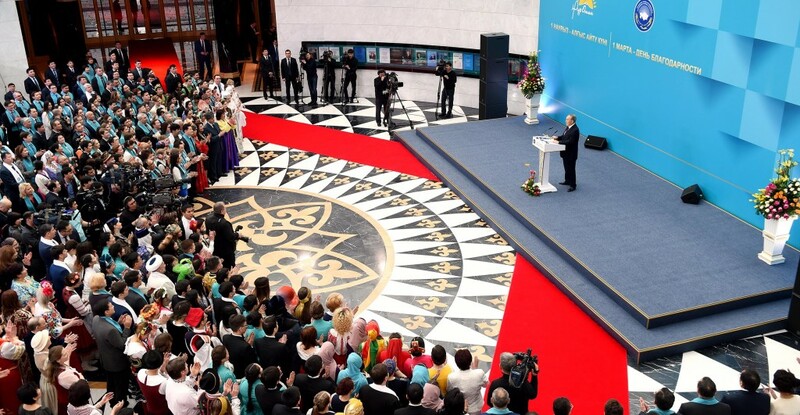 ASTANA – President Nursultan Nazarbayev congratulated the people of Kazakhstan with the Day of Gratitude celebrated in the nation for the first time on March 1. He explained how the country’s difficult historic and political past is related to this holiday and how multi-ethnicity was formed. 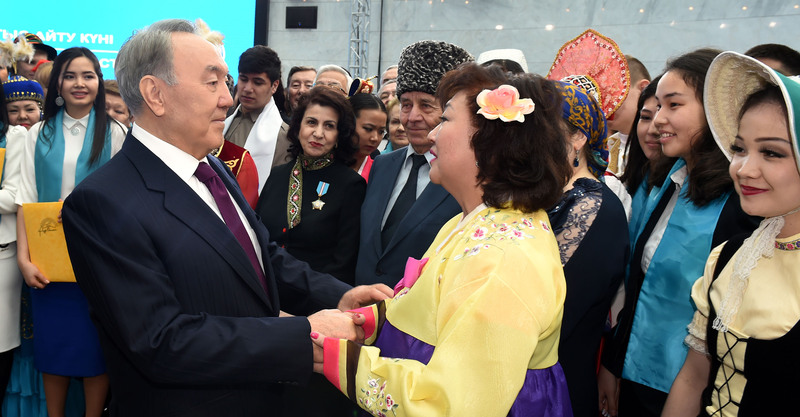 His proposal to establish the celebration was delivered at the 2015 session of the Assembly of the People of Kazakhstan (APK) and received wide public support. Nazarbayev noted many pages of the country’s history are related to gratitude as one of the highest moral values. “In the tragic years of political repressions and deportations of the 20th century, millions of people were grateful to each other for help and support. This gave strength and ability to survive to people deprived of everything, to regain hope and rebuild their lives,” he added. The President indicated the day is necessary to draw lessons from Kazakhstan’s multi-ethnic history. “In the course of the peasant resettlement period of the Stolypin reforms, 1.15 million people were moved to Kazakhstan from Russia, Ukraine and Belarus. In the 1930s during the period of collectivisation of the former USSR from the central regions, 250,000 dispossessed kulak peasants were exiled here. During the same time, 1.2 million people were sent for the construction of industrial facilities,” said Nazarbayev. He noted entire nations of about 800,000 Volga Germans, 102,000 Poles, 507,000 people from North Caucasus, including Chechens, Ingush and others, and 18,500 Korean families from the Far East were deported during Joseph Stalin’s regime. “They were unloaded from freight wagons right into the bare steppe in the cold of winter. Only Kazakhs lived here at that time. And in extreme need themselves, Kazakh families were taking them to their adobe homes. My family was one of them,” said the head of state. The President recalled that during the years of Stalin’s repression in the country, special camps were set up containing thousands of prisoners. “Many of them did not leave after the liberation, but remained to live in this land,” said Nazarbayev. According to the President, people also resettled in Kazakhstan as a result of the military evacuation, developing virgin and fallow lands. “We were able to unite all ethnicities into a single, cohesive nation in the new era of independence. Today, this is our main advantage. Therein lies our strength. On my instructions, those pages of our history will be reflected in expositions of the new Museum of National History in Astana,” said Nazarbayev. The head of state stressed that everyone suffered from the totalitarian machine of that time. “On my instructions, under the Plan of the Nation, the Assembly’s role was legally approved as a coordinator of all charity campaigns throughout the country. The history of the Assembly is a history of our friendship and stability,” he added. The President noted the art of living together in peace and accord is Kazakhstan’s most valuable experience, especially in the present day, when migration chaos has begun in global economic crisis conditions, aggravating interethnic and social conflicts. “It is important to celebrate the Day of Gratitude with special actions of charity and support to all those in need. In this regard, it would be good set up a special fund of the Assembly of People of Kazakhstan, with the help of which the support would be provided. Public actions to address socially-significant issues in every village, district, city and region are of particular value,” he said. The President also noted the equality of all citizens, regardless of national and religious belonging, was proclaimed in the country’s constitution and legislation. “It is necessary to clearly fulfil these prescriptions of law; anyone cannot be allowed to interpret them at ease. And in this matter the special role belongs to the Assembly of the People of Kazakhstan. I have already had to talk about this due to abuses that have occurred,” added Nazarbayev. He emphasised the importance of knowing three languages. “We are headed for trilingualism and this is not someone’s whim, but an imperative of the time. We have to know the state language, the language of the titular ethnic group. Therefore, we are teaching Kazakh to children in school. We must also know English because it is the language of science, innovation and information technology. It is essential to know Russian as a language of interethnic communication. It is necessary for our children,” said the head of state. Nazarbayev said Kazakhstan’s welfare, public accord, stability and unity are a pledge of the country’s happy future. “Children of the Land of the Great Steppe imbibed the diversity of cultures, values of different ethnic groups and religions with mother’s milk. Our history and our ancestors taught us this. Ethnic diversity is not a weakness of our country, but its wealth,” said the President. 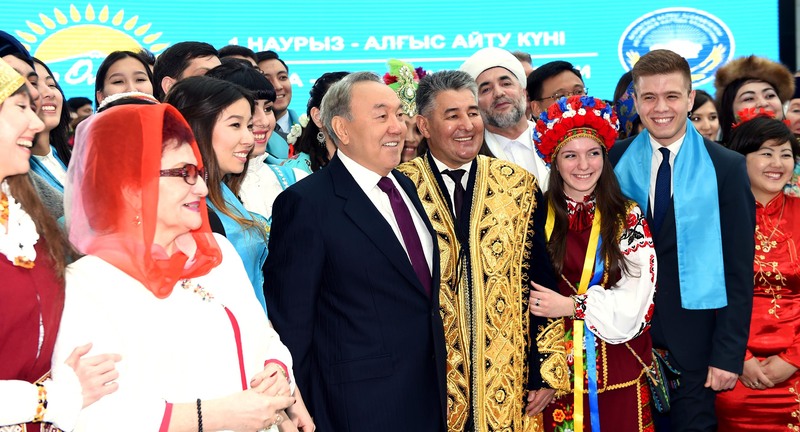 Members of APK, the Nur Otan party, ethnic-cultural union, academic and artistic communities and youth participated in the event which took part at the Nazarbayev Centre.